Honeyguide Tented Safari Camps offers a unique blend between a classic stay in safari tents and the best of contemporary design. It consists of two camps in total, Khoka Moya and Mantobeni, just with twelve large tents each. Every one of them is appointed beautifully, with some elegant touches. The tents are reminiscent of the Hemingway-style safari. There's a very comfy kingsize bed, huge couch to relax on, and a perfect bathroom. Whereas the safari tents are classic, the main lodge area reflects a much more modern African style. It indeed is a stylish structure in the middle of the South African bush. This is the place where you gather for meals, activities, a drink or just to socialise with other guests. You can lounge around in the indoor or outdoor areas, or select a fine bottle of South African wine from the climate controlled wine cellar. Of course, there also is a pool, a very welcome luxury after a day of safari in the bush. Of course your stay in Honeyguide revolves around a daily routine of making safaris and exploring the bush. Game drives are conducted twice a day in special 4x4 safari vehicles. The rangers possess a vast knowledge about all that lives and grows in the area, and happily inform you about it. Morning gamedrives usually start around half past five in the morning, taking you deep into the large Manyeleti concession. During the drive you will stop for a (much needed) cup of coffee and light refreshments. After breakfast there is time to unwind, you may choose to retire to the privacy of your tent, broswe through the small in-house library, or relax at the poolside. Another gamedrive start around half past three in the afternoon and continues to just after dark. This allows you to spot nocturnal animal species, an exciting experience. 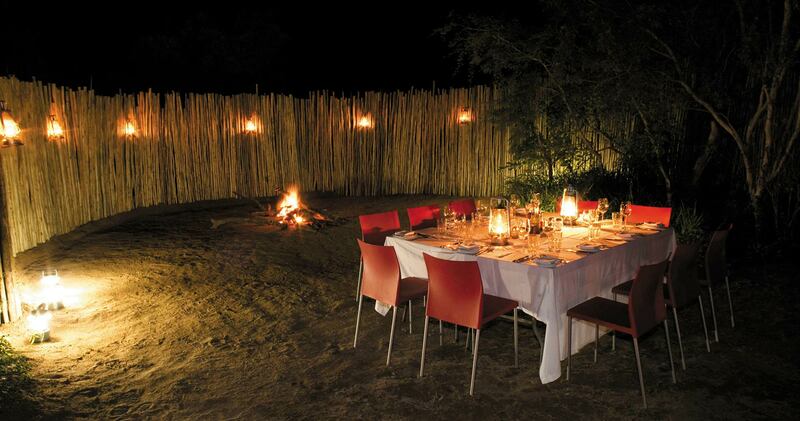 A sumptuous dinner under the stars awaits you when you get back to the lodge. Designed to reflect Hemingway’s Africa, the 12 East African styled tents offer guests an authentic safari experience (no children under 12). The tents are comfortably furnished with double or twin beds, cotton sheets and damask linen, soft leather couches and en-suite bathrooms that include a large concrete bath, double shower and separate toilet. The central guest facilities include a reception area with a lounge and a small selection of books, indoor and outdoor relaxation areas, a bar and climate controlled wine cellar. The swimming pool deck adjourns the public area and overlooks the waterhole. The camp has complimentary WiFi facilities. Sweeten the deal when booking a two night stay at Honeyguide Mantobeni and receive one night free of charge. This special offer is valid between 1 April 2019 and 30 July 2019. Khoka Moya comprises 12 contemporary styled tented rooms, set on screeded concrete slabs and furnished in a comfortable, minimalistic style. A family affair, the tents are large enough to easily accommodate four guests. 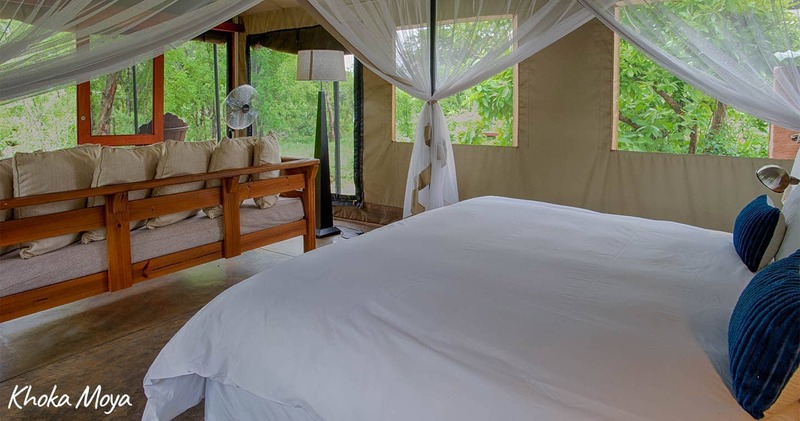 They have en-suite bathrooms with double showers and separate toilets; as well as private outdoor seating areas to relax and take in the sights and sounds of the bush. Simply designed and built of corrugated iron, the large colourful lounge and dining areas of the camp overlook green lawns leading to the swimming pool. Situated on both sides of the riverbed you will be able to enjoy an authentic safari experience without sacrificing luxury, safety or comfort. Book your Manyeleti safari adventure at Honeyguide Khoka Moya for three nights and stay an extra night for free! This special offer is valid between 1 April 2019 and 30 July 2019. The tents are not your average pole in ground tents, these compare to 5 star hotel rooms, except they are better. The food and service is amazing and all included in the price, not to mention the actual safari experience twice a day. We stayed at Khoka Moya with our three children aged from 10-13yrs. On arrival there was much excitement with an elephant in the camp to welcome us to an African safari. Everything about Khoka Moya was excellent. The tents were as good as they look in the publicity pictures. The food and game drives were excellent. None of us will ever forget watching a pride of 15 lions under the expert guidance of Richard. I saw the big five within two game drives... Enough said right? Let's just say I saw wild dogs mating, went on a hunt with a leopard and saw him pursue and kill a warthog, and a pride of lions?!?!?! Crazy right? ... This is the place for people who like being out in nature but not having to rough it in any way! The food is three course and the guides make you feel at home. I didn't suffer a single mosquito bite and was able to fall asleep to the sounds of nature (sometimes lions right near my tent.... ) and then was awakened with the rising of the sun. Bathroom is large and spacious and includes two showers and a tub! One of my favorite things was to sit on my leather couch on my deck and read during the down time between safaris. 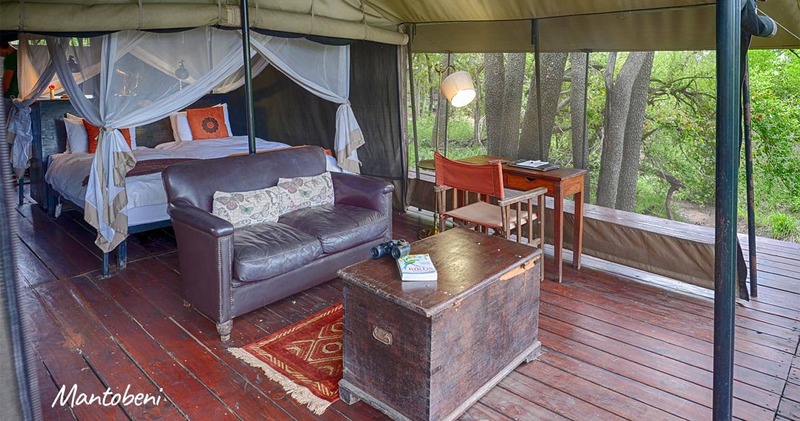 Honeyguide Tented safari camps consist of two seperate lodges. 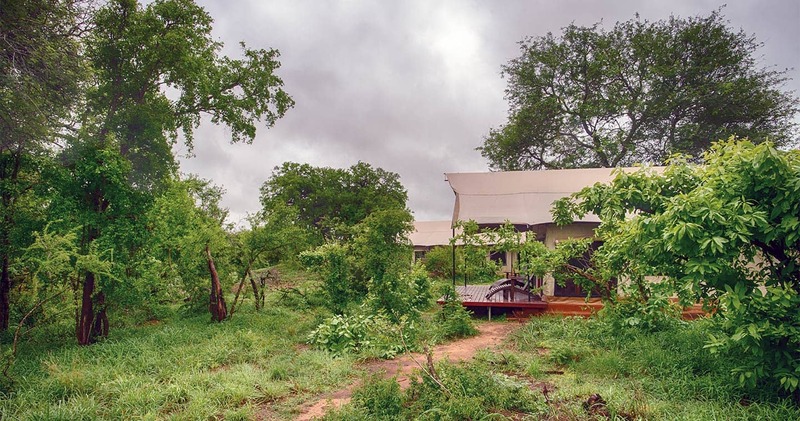 Honeyguide Mantobeni Camp is the perfect getaway for couples whereas Honeyguide Khoka Moya Camp is ideally suited for families. Explore our big Manyeleti map for more. Manyeleti Game Reserve is a happening place! Special offer: A special offer is available between 1 April and 30 July. It's (pretty much) always sunny in Manyeleti! Read all about travelling to Honeyguide Tented Safari Camps on our getting to Manyeleti page. No children under 12 years old are allowed at Honeyguide Mantobeni Camp. Children are welcome at Honeyguide Khoka Moya Camp. Infants aged 0 - 2 years old stay free of charge. Children aged 2 – 12 years of age are charged 50% of the adult rate. Children over the age of 12 are charged as adults. 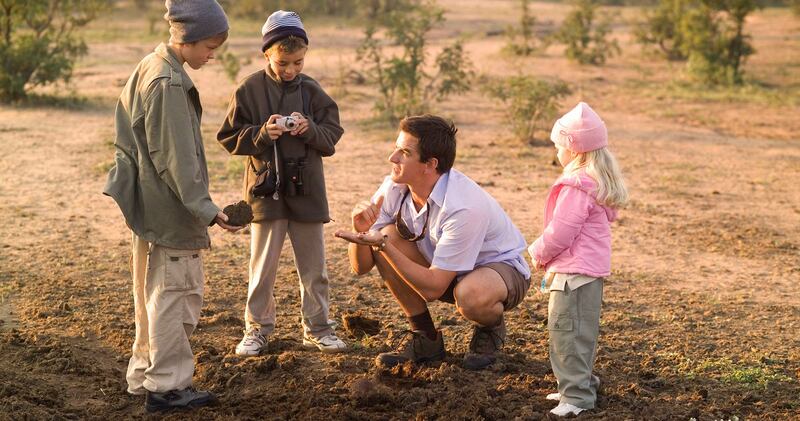 Children of all ages are permitted on game drives. Babysitting facilities are available, subject to availability and with prior notice. We hope you have found all information needed to decide that Honeyguide Tented Safari Camps in the Manyeleti Game Reserve is the perfect place for your next travel adventure. Please fill in the contact form and we will get back to you soon!